The curse of childhood is being different somehow: too tall, too brainy, not ordinary enough. Kids want to blend, they want to belong. Being tagged as an outsider can be punishingly hard. For LGBTQ kids, being different can be especially tough. With heterosexuality the predominant cultural norm, it’s easy for homophobia to take root. Homophobia grants permission for bullies to do what they do: ridicule in the lunchroom, taunt on the playground and, in the worst cases, even deploy physical violence. Growing up isn’t easy for anyone, but growing up outside the constraints of the normative sexual and gender identity spectrum is perhaps even harder. Which is why LGBTQ Connection has come to town. The group’s mission is to drive culture change while growing a movement to support LGBTQ people – and they’re doing it one conversation at a time. One of the only comprehensive LGBTQ programs in the North Bay, LGBTQ Connection has developed strategies to drive culture change and grow a movement, while supporting LGBTQ people who feel marginalized. It runs established programs in Napa and Santa Rosa, and is getting its Sonoma program off the ground. Like most big ideas that aspire to change culture, progress is slow. They’ve launched a youth leadership team and are holding bimonthly support groups. And they’re looking for permanent quarters in town to set up shop, a place where LGBTQ people can find gentle support. 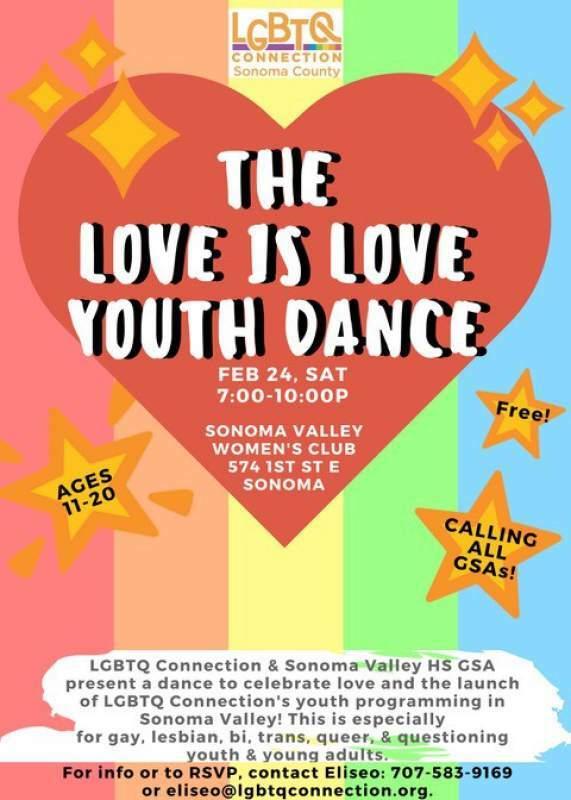 They’ve also scheduled a dance party for LGBTQ kids and the people who love them to come together and simply have fun. It’s called “Love is Love” and is scheduled for Feb. 24, with two decoration-making events in advance on Feb. 8 and 22. “I was talking to this young trans woman, and she said ‘Where’s the LGBTQ at? Where’s the fun?’” Rivas said, explaining the origins of the concept behind his big fat queer prom. “These kids feel like the Valley isn’t for them, that it feels really stuffy.” With an exuberant fashion sense and an irrepressible joy, Rivas seems ready to correct that misperception. Do you have to be queer or transgender to attend “Love is Love”?